Max Zoberman chose Emory based on the strength of the political science department and the University's reputation for extracurricular engagement. Now a junior in Emory College, he recently won a landslide victory to become the next president of the Student Government Association. Max Zoberman still remembers the exact moment during a campus visit that he knew Emory University was the place for him. Hearing a campus tour guide describe the opportunities for extracurricular engagement definitely piqued his interest. And learning about the deep bench of talent in Emory's political science department only sharpened his intrigue. But it was the chance to attend a lecture — to this day he still recalls the topic — on presidential voting trends since 1980 presented by Andra Gillespie, associate professor of political science and director of the James Weldon Johnson Institute for the Study of Race and Difference, that clinched his decision. 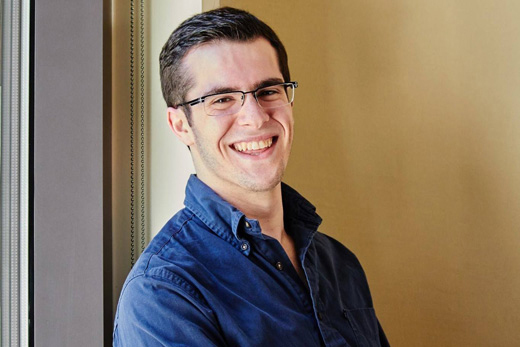 "I knew that not only did I want to come to Emory, I wanted to study in the political science department and have a robust extracurricular career," he says. Three years later, he's done just that. Last month — with 71.2 percent of the vote — Zoberman was elected Emory's Student Government Association (SGA) president for the 2016-2017 academic year on a platform built around issues of campus safety, including support for both the mental and physical well-being of students. The position follows several years of participation in Emory's SGA, including experiences as a student legislator, committee and task force chair, and as the current SGA executive vice-president. Emory Report caught up with Zoberman, a junior in Emory College of Arts and Sciences, to talk about what draws him to public service, as well as his ambitions for the coming year and beyond. How did you discover Emory? I've always been very interested in going into law. My mother is an attorney, my father is an attorney, and my brother is in law school, so it's kind of the family business. But I first wanted to study political science, and Emory came to my attention because of the political science department. With people like professors Merle Black and Alan Abramowitz, there were just all of these incredible, nationally-known names. That's what made me come here and tour and what ultimately sealed the deal for me. You arrived looking for campus engagement. How did you find it? My first year, I rowed crew — an incredible experience and the most physically challenging thing I've ever done — and served as vice-president of Emory's mock trial team. I also learned the hard lesson that many Emory students do, that pre-med was not a viable option for everyone. I actually flirted with it for about half-a-second, but a semester of Gen Chem (general chemistry) proved that it was not for me. How did student government come into the picture? Following winter break my freshman year, I checked an email about freshman and sophomore positions on the SGA. I had never been involved in student government in high school. So I reached out to Jon Darby, who was running for SGA president at the time, and asked him what SGA looked like. He told me that it's not a perfect institution, but it actually has the ability to do good things, it manages its own budget, and has its own special sphere of influence. My girlfriend painted my first campaign banner for me as a surprise — I discovered it hanging on a bridge — and I was first elected to the SGA as a sophomore legislator. What made you want to continue working with the SGA? With SGA, you get out it of exactly what you put into it. If you put in most of your time, attention, effort and energy, you see results almost immediately. When they called for applicants for committee leadership, I applied and was made freshman chairman of the Campus Services committee and also chair for the Task Force on Crisis Prevention and Safety, which was great. In those capacities, I saw what Jon was talking about. You could get things done. That year, I ran the free shuttle program, which ferries students to the airport for holidays and spring break. For the first time, I was writing, signing and managing a contract with a vendor — a small thing, but an important service for several thousand students. Looking back, what accomplishments have given you pride? The Guardian Initiative, which at this point is not one initiative, but rather a top-to-bottom re-evaluation of our preparedness for sexual violence and campus safety. It subsequently ballooned to encompass everything from SafeRide to blue lighting to potential partnerships. You ran for SGA president on a platform that included campus safety and mental and physical well-being. What fuels those interests? My entire life I've believed that if you can have control over nothing else, you should have the agency to have control over yourself, your body. Violence is a violation of that essential agency; it certainly applies to sexual violence. Nobody has the right. I take violence against members of the Emory community as a personal affront. As for mental health issues, someone I loved very much went through an experience that made me realize it is a one of the least understood, most stigmatized forms of illness. College can be a stressful, taxing experience. Mental health is one of those invisible dangers that almost no one talks about. It's a responsibility of student advocacy to say that it isn't a sign of weakness; we all have a vested interest. You are finishing a term as SGA vice-president. What made you decide to run for the top job? For a while, I was going to graduate Winter 2016, and yet was still going to run for president, regardless. Then Raj Tilwa, the current SGA president, said, "As your friend, I'll support you whatever you do. But as the president of the student body, it's not responsible to run knowing you'll be leaving half-way through the year." That really gave me a reason to reflect on why I wanted to run. When I ran for vice-president, I made commitments to a lot of long-term initiatives and programs. My father always said, "Without your word, you are nothing." So I decided that if I left Emory without doing all I could to get these things done, it would have been a violation of trust. Handing off multi-year initiatives would have been like me saying, "I care about these things, but not enough to stick around." That's not who I'd like to believe I am. What's still on your campus to-do list? One of the things I was most passionate about was the installation of more blue safety light fixtures. We already have a commitment of money for that for next budget cycle, so that will be happening. I also want to continue working with representatives from the White House Task Force to Protect Students from Sexual Assault to make Emory an academic partner of the "It's On Us" campaign. And there are other initiatives and projects and programs that I've inherited. What do plans look like after graduation? But I find peace in that, because it is a career path almost exclusively dedicated to being in service — military service, civil service, public service. It's an exercise in delayed gratification, but I love the work.